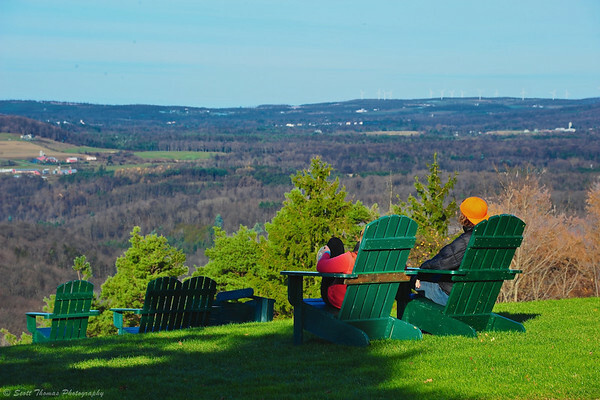 People enjoying the view from green Adirondack chairs near the Skyline Lodge at Highland Forest in Fabius, New York. Nikon D700/28-300VR, 1/125s, f/13, ISO 200, EV 0, 170mm focal length. Onondaga Country Parks held an open house at Highland Forest in Fabius, New York for people to preview all the winter activities they can enjoy in the park last weekend. The day was sunny and breezy which made it hard to think of the snow and cold I shared with you the last time I visited Highland Forest. As you can see, autumn colors are practically nil this late into November as the trees have shed their leafs. Inside the Skyline Lodge, tables were set up for groups presenting nordic skiing, snowshoeing, orienteering and biathlon (an Olympic sport combining cross country skiing and marksmanship). Outside, people could try some paintball biathlon. 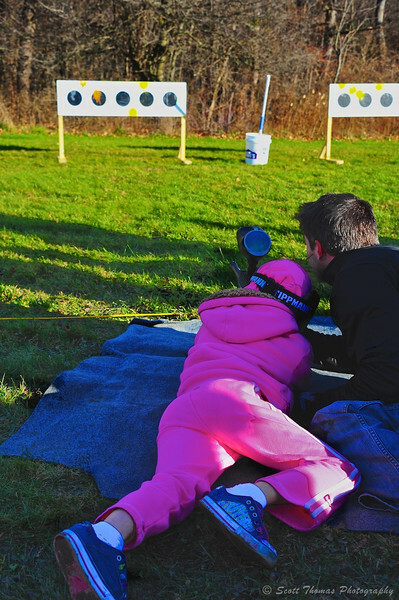 Father helping his daughter with a paintball rifle during the Onondaga Parks Open House at Highland Forest in Fabius, New York. Nikon D700/28-300VR, 1/250s, f/8, ISO 200, EV 0, 44mm focal length. 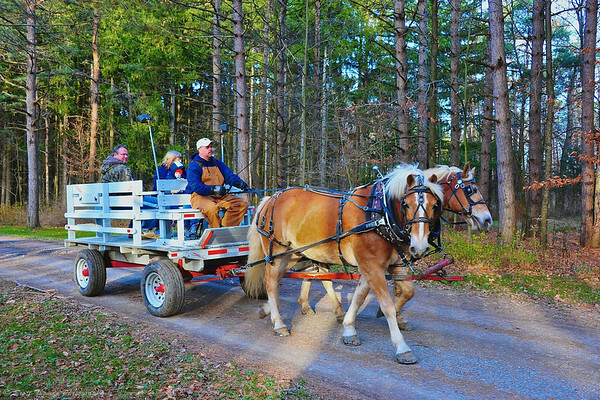 My wife and I enjoyed a much warmer and brighter ride as the Cooperstown Carriage Company, who do the winter sleigh rides at Highland Forest, were giving complimentary wagon rides using their beautiful Haflinger draft horses to pull them. Cooperstown Carriage Company gave complimentary wagon rides during the Onondaga Parks Open House at Highland Forest in Fabius, New York. Nikon D700/28-300VR, 1/125s, f/8, ISO 1800, EV 0, 36mm focal length. Back at the Skyline Lodge, we enjoyed some hot ham and potato soup, crackers and cheese. After which we investigated the Onondaga County Parks tables and learned about snowshoeing and cross country skiing lessons and rentals. I am also interested in coming back to photograph a few competitions held for winter sports at Highland Forest. This entry was posted in Weekly View and tagged adirondack, autumn, biathlon, chairs, cooperstown carriage company, fabius, haflinger, highland forest, horses, landscape, new york, onondaga county, open house, paintball, parks, rifle, skyline lodge, target, vista, wagon. Bookmark the permalink. There was some running involved with the paintball biathlon to simulate how hard it is to exert oneself and still hold a rifle steady. The people who tried found it harder after each lap. The horses would have loved them! Oh, I’d love to be in that adirondack chair right now! I love these great pictures and the ones you posted on flickr too. What a gorgeous place to visit ! So peaceful to sit in those special chairs and enjoy the landscape. I’d love to sit on one of those chairs and just enjoy the view. Something I seldom do.